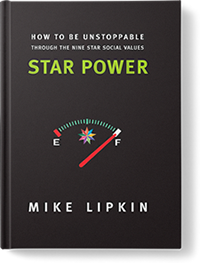 In this remarkable handbook, Mike Lipkin uses the acclaimed Environics research and his engagement with over a million people to define the Nine Star Social Values. These are the traits that enable preeminent performance against all odds. Lipkin coaches you on how to own and integrate each Star Social Value to create your own extraordinary breakthroughs. Star Power is an electric fusion of motivational mantras and personal explorations. You will find out how good you really are and how amazing you can be – in every aspect of your life. Lipkin has created a highly entertaining learning experience that will excite you into immediate action. Star Power is a fast, enjoyable read that is designed to be shared with everyone around you. Enjoy it and pay it forward. Mike Lipkin is founder and chief partner of Environics/Lipkin, an internationally acclaimed motivation company based in Toronto, Canada. He is also a global motivator who has spoken to over a million people in 43 countries. This is his fourteenth book. Order your book today and we’ll send a free copy to someone of your choice anywhere in North America. Just order your book and we’ll follow up with you regarding the person to whom you want to send your free copy.